Create a dedicated space where your kids can let their imaginations run wild and Lego bricks can tidily reside, safe from vacuum cleaners and the delicate soles of bare feet, by converting a cast-off table into a Lego building station. My kids love Lego so much that it borders on obsession. We have a lot of these plastic bricks and, until recently, no way to keep them easily accessible and ready for play. So, we decided to make a Lego table. Sure, you could buy one—but they’re both expensive and not necessarily the most attractive piece of furniture to place in your living room. 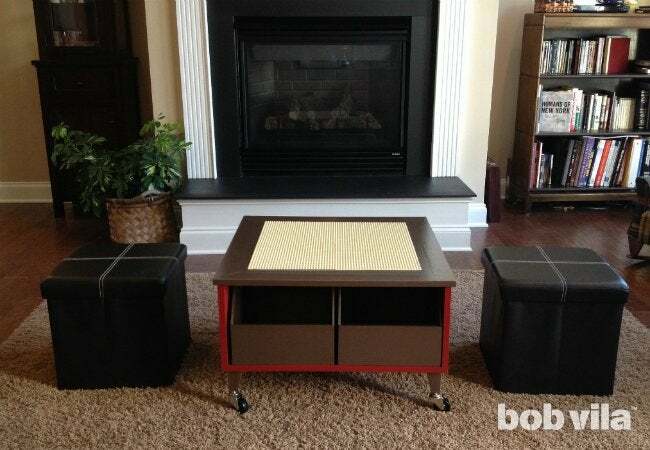 You can, however, make a functional, good-looking Lego table by upcycling a piece of furniture you already have, or tracking one down at a thrift store or garage sale. In fact, if you can let your imagination see the potential in something that’s been cast off, creating a Lego table can be surprisingly easy. 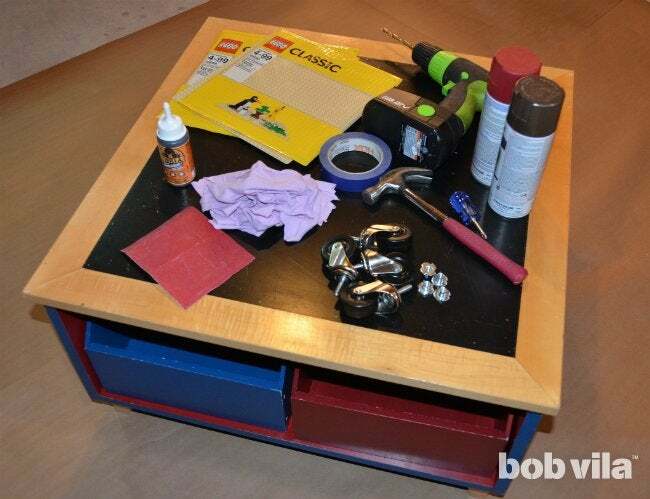 If you know how to spray-paint and glue, you can DIY a Lego table! We also added casters to ours so we could roll it from room to room, but even that process was not difficult and required only a drill and hammer. Kids can help with most parts of this project, but when it’s time to paint, I recommend letting them hold the top of your hand while you apply the spray paint, rather than allowing them to spray-paint by themselves. Small fingers may not have the strength and control necessary for a quality job. Likewise, be cautious with the superglue, as it can cause irritation if it makes contact with your skin. For this project, we started with an old thrifted table so we wouldn’t have to build the base from scratch. 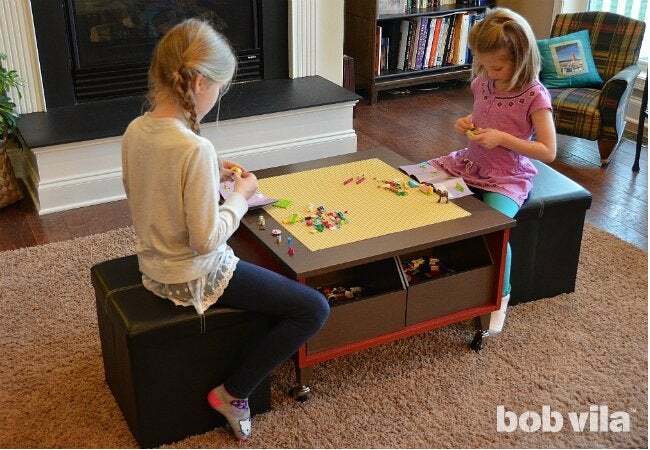 Coffee tables, end tables, side tables, and play tables make great candidates for upcycling into a Lego table—especially when they’re already equipped with room for storing all those tiny pieces. Our table came with bins in it, as if it were born to be a Lego table. If your table doesn’t have drawers, consider how you might solve this storage dilemma, whether by fitting a bin on an open shelf under the table or attaching hooks and buckets to one side. Another key factor to keep in mind: surface area. 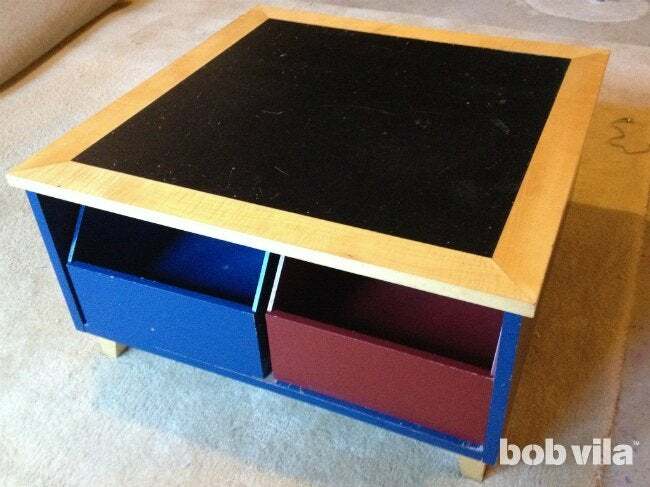 Ideally, you’re repurposing a table with a square or rectangular top that will be mostly covered by Lego baseplates. Baseplates come in 10-inch and 15-inch squares, so as you’re selecting your table, consider how the baseplates will lay out on the surface. Carefully inspect your table for any areas that might need repair. 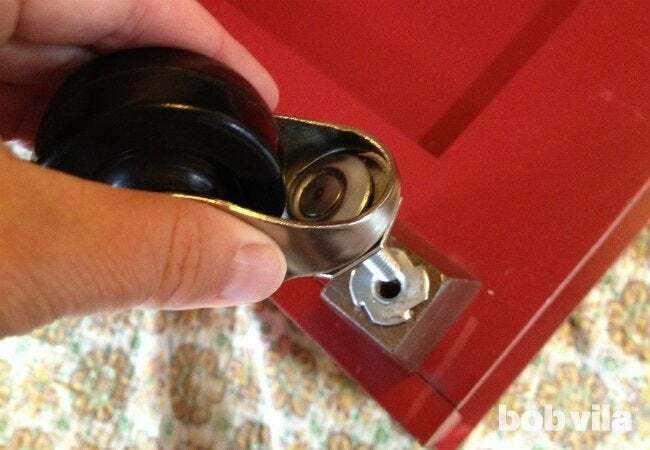 Glue any loose or broken pieces, and sand down any rough spots. 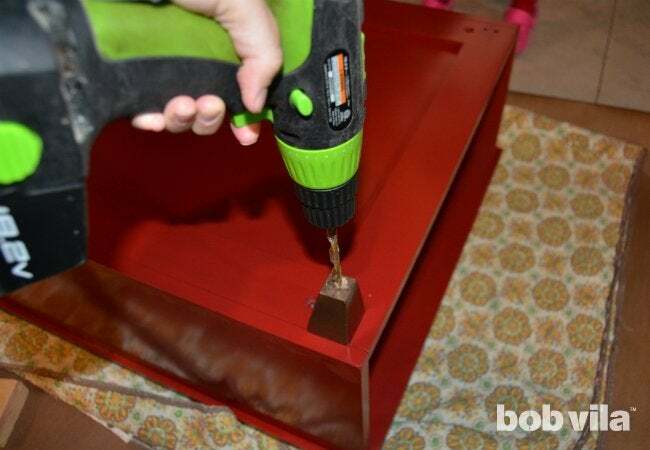 Vacuum and wipe the table thoroughly, then allow it to dry before you start your paint job. 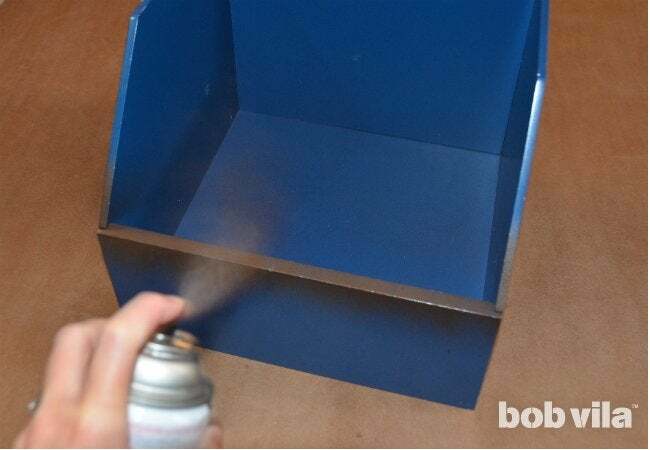 Hold the can of spray paint about 12 inches from the surface, and apply using a back-and-forth sweeping motion. Distribute the spray just a little wider than your piece: Start depressing the nozzle a couple of inches off the left edge of the piece, sweep across, and let go a couple of inches outside the right edge. For best results and fewer drips, apply several light coats (leaving an hour to dry between each) rather than a single thick one. To protect the newly painted finish and help it resist chipping during the playtime that’s sure to ensue, apply at least two coats of spray urethane, employing the same technique you used for the spray paint. Allow the urethane to dry for at least 48 hours to completely cure. Once all the painting is done, reassemble any pieces you took apart. In this project, that meant screwing the legs back into place to prep them for casters. If you are using casters, flip your table onto its top and attach them to the legs. For wheels with a threaded stem, drill a hole into each leg, hammer a T-nut into each one, and screw the casters into place. If you’ve picked up a set of plate casters, simply use four screws to attach each metal plate to a leg. Finally, it’s time to attach the baseplates using superglue, which will bind them to almost any tabletop. Measure out and mark where the baseplates should go. Lightly dampen the surface of the table according to the manufacturer’s directions. Apply glue to the bottom of each baseplate, one at a time, and place it on the table. When all the baseplates are in position, either clamp them down or weight them with something heavy to help them bond while the glue cures. Some superglues (for example, Gorilla Glue) expand by three to four times as they cure, so do not apply glue too close to the edges of the baseplates, or you’ll end up with a mess. If some glue does seep out during the curing process, lightly chip it off with a sharp screwdriver. Then sand down any chipped paint, mask the Lego baseplates, and touch up the top with spray paint. When everything has cured and dried, roll your new Lego table into the designated play zone and call in the troops! My kids can’t wait to build on it, and I can’t wait to see where their imaginations take them.